I found this video online for this project and was completely inspired to try one of my own. Sorry for the poor image. Our camera has problems. I cut out the E and our last name in white cardstock to use as a stencil. The video uses Cricut stencil material, but I find if you are really careful, you can do the exact same thing with heavy cardstock. First I painted black an 8x10 canvas that I got at Michaels. It took several coats to completely cover the white of the canvas. After that dried, I used painter's tape to adhere the E stencil to the canvas, then carefully, using a regular paintbrush lightly loaded with paint, painted the monogram. After it dried there were a few tiny touch-ups needed with the black paint to clean it up. 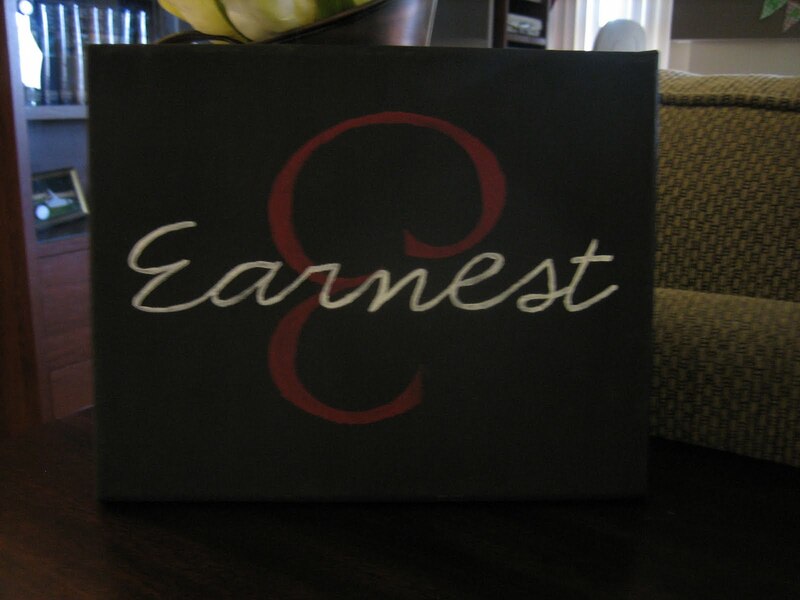 Then I centered the name stencil over the monogram and painted it the same way. This would make a great gift for a wedding or housewarming gift! Looking good...I'm happy that you came to NTT to show it off...hope you had a good time!